CONNEX™ ProSight is the missing link needed to usher in a new era in FPV racing. Plagued by analog systems’ poor image quality, and connectivity issues in multi-pilot scenarios, the sport needs a breakthrough to take it to the next level. CONNEX ProSight is just that, transforming FPVdrones into a completely new kind of immersive experience for beginners and experts alike. 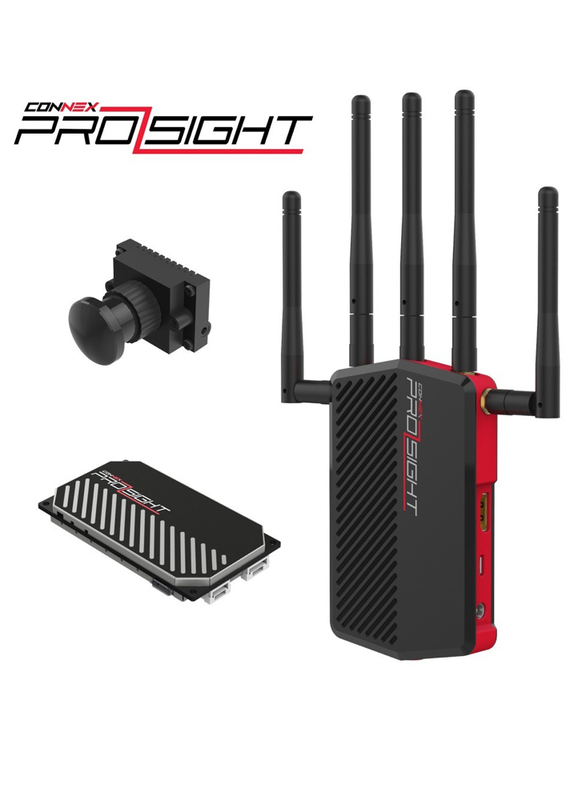 The CONNEX ProSight is the new standard in FPV Racing, an all-digital, delay-free, HD video solution. It is designed based on CONNEX’s unique and proven technology – used by professional drone users as well as the Hollywood movie industry. Robust Digital HD Receiver The CONNEX ProSight ground receiver unit provides a robust digital link over the 5GHz band. Its HDMI interface, compatible with all popular HDMI goggles & screens in the market. NOTE: The Connex ProSight will require HD compatible FPV goggles or monitor for use (HDMI in). FAQs - Click on the 'Advice' tab. Amimon is the market leader in latency-free wireless HD video solutions. Q: How many channels does Prosight support? A: Prosight has an advanced frequency setup for multi-pilots, with both automatic and manual modes, supporting up to 27 digital channels (FCC). Q: What is the range of a Prosight link? Q: What is the Prosight camera resolution? What is the Prosight receiver output resolution? A: The Prosight camera has a 720p30 sensor (1280x720 pixel, 30 fps) with High Dynamic Range (HDR), suitable for daylight and nighttime flights. The Prosight HDMI receiver output is 720p60 (1280x720, 60 fps), supporting standard HDMI screens and goggles. Prosight was validated to work with: any computer screen, Glyph, Fatshark v3 and HD V2. Quantum, Headplay, Atomos, Swit, Feelworld. Q: What is the Prosight video delay from camera sensor to the receiver HDMI output? Q: Will the Prosight transmitter work with CONNEX or CONNEX mini receiver? A: No. These are two separate systems that do not interact. Q: Can I use my own camera with Prosight transmitter? A: No. The Prosight transmitter supports only with the Prosight camera. Q: Is Prosight certified for RF regulation? A: Yes. Prosight has certification for US (FCC), EU (CE), Australia & New Zeland, China and Korea. Other region regulations will follow. Q: Will Prosight work in non-line-of-sight conditiond? A: The specified range of 300 to 1000 meters / 1000 to 3000 feet assumes clear line-of-sight. Prosight was tested to work very good in underground/parking lots. Lower performance may be expected when used in woods and forests. Q: Will Prosight work at night? A: The Prosight camera has high dynamic range (HDR) of 115dB, allowing it to function extremely well at almost any lighting conditions. Q: Will Prosight coexist with analog video systems? A: Yes. At adequate frequency allocation, the systems will coexist perfectly. Q: Can I use my Prosight receiver to view my friend’s Prosight’s flight?